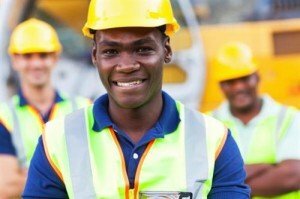 Working as a construction laborer or helper can be an excellent starting point if you wish to learn a skilled trade. It is also a good career for anyone that enjoys physical labor and the outdoors. While it is a starting position, many workers find enjoyment in the variety of work and continue with the position until retirement. As a laborer or helper, your work will involve assisting a skilled trade or general contractor. If you work in general construction, you will be involved in site clean up, unloading supplies and carrying materials to the appropriate locations. Helpers will often be involved in digging and back-filling holes or taking measurements. If you work with a specific trade, you may have specialized duties. Most of the work will require only a small amount of training to start. For example, excavation crews use site shooters to determine the depth of a dig. As a helper, you would hold a grade rod at the bottom of the excavation and watch for a laser to indicate the correct depth. An assistant in concrete work might help lay out forms and rebar and broom finish surfaces. As an electrician’s helper, you could be involved in stringing temporary lighting, replacing bulbs and assisting with wire pulls and conduit runs. Most helpers and laborers will receive on-the-job training. In the majority of cases, a high-school diploma or GED is required. Many employers will accept a written test if you do not have a diploma or GED. To be successful, you should have a strong reading ability and reasonable math skills. On most jobs site you must also be 18 years of age or older. Higher math skills can be helpful to progress in a skilled trade. The ability to read a blueprint is also a desirable skill. Laborers involved in hazardous materials must have specialized training. Many employers will require you to complete a safety-training program or series of OSHA classes. Opportunities to begin working in the industry can be found through contractor’s groups, apprenticeship programs and unions. Trade schools, vocational schools or community colleges often offer classes and full-programs designed to help further your career in a skilled trade. According to the Bureau of Labor Statistics, the median annual pay for helpers and laborers was $28,410 in 2010. Much of the actual pay will depend on the area of construction you are working in. If you choose to start as a helper to learn a skilled trade, there is enormous potential for career growth. Training on the job and through schools can lead to work as a heavy equipment operator, plumber, electrician and more. Other opportunities include becoming a building inspector or foreman. You could end up starting your own construction business with the skills you develop. Do not take a construction position that is under the table. This is the type of work where you are paid by cash and not considered an employee. Construction work can be dangerous. If you are working under the table, you may not be covered if you are injured on the job. You can get more information on the types of educational opportunities by filling out the information request form. There is no obligation and you may find the career choice that is perfect for you.